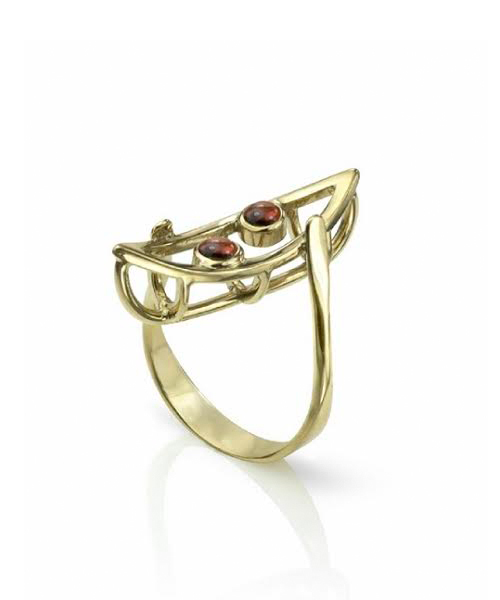 Devarati Angela Sammon is a goldsmith, jeweller and designer. She enjoys being and exploring out in nature and discovering the peace within. Angela's academic journey began with an Honours Bachelor of Commerce Degree from Laurentian University in Sudbury, which led her to working as a Chartered Accountant in Toronto. Her journey continued by becoming certified as a meditation teacher, and then facilitating retreats and working as a spiritual coach throughout Canada, USA, and in Germany, Austria and Denmark. Devarati Angela's love of exploring the beauty and aliveness of the Canadian landscape from a young age, and later her exploration of Spirit inspired her to create jewellery with sterling silver and semi-precious stones. In 2010 she then enrolled in the Jewellery Arts program at George Brown College discovering more about gemstones and obtained skills in complex fabrication with precious metals, casting, model making, jewellery repairs, gemsetting, Art Cam, and designing. She received the Gambhir Award for Academic Excellence in April 2013 and her 18k Canoe in Motion ring was in the Final exhibition of Opine-Student National Exhibition. Devarati’s jewellery designs carry a spiritual and elegant quality and are an expression of spirit, aliveness, peace, beauty and joy. She enjoys a challenge and is good at complex fabrication, metal finishing, and bringing stones together in a piece.